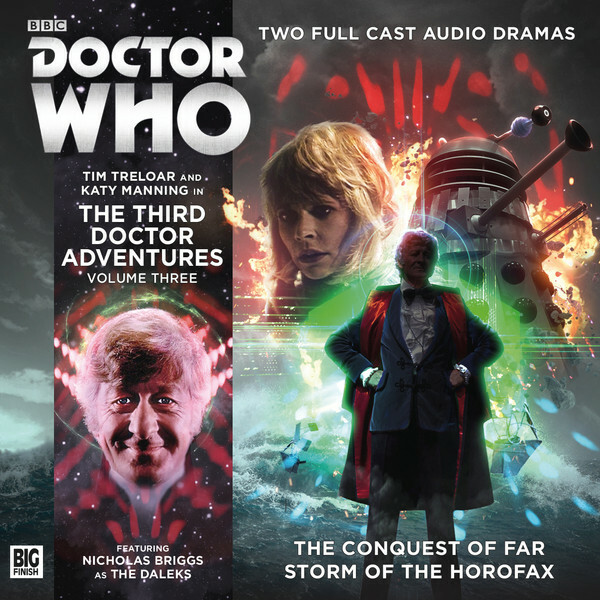 Following an exhilarating off-Earth clash with the Daleks in ‘The Conquest of Far,’ The Third Doctor Adventures Volume Three returns to its era’s contemporary Earth for a UNIT-based alien encounter in Andrew Smith’s ‘Storm of the Horofax.’ When the Doctor, Jo, and UNIT are called in after the HMS Nemesis comes upon an alien ship unknowingly leaking particles that subject the surroundings to time disruption, they soon find that the sole occupant, Arianda, is not quite the innocent victim she claims to be. Much like the first serial of the set took the Daleks to unexpectedly brutal and strategic territory, ‘Storm of the Horofax’ takes what is set up to be a straightforward alien invasion tale and completely subverts expectations as the truth behind Arianda is slowly revealed. Her initial attempts at subterfuge regarding her true identity allow for some very strong scenes with Jo that come back to resonate all the more profoundly later on, and both Robin Weaver and Katy Manning do superb work in conveying their respective emotions and reactions to the plan Arianda sets in motion to ensure and secure her own future. As a Provost of the Horofax, Arianda has the ability to remember both the past and the future, her very being perfectly in tune with the timelines; foreseeing a time when humans rise up and end the reign of the Horofax and their Provosts, she crafts an explosive plan to turn the paranoia and hostility of humanity upon itself to ruin Earth before that future has the chance to manifest. ‘Storm of the Horofax’ is unafraid of flaunting the temporal component of its script while still remaining perfectly accessible to those wanting a more traditional tale of incursion. Time was rarely a focal point of the narratives in the classic era, but a group of adept individuals from any and all species throughout the cosmos whose members find each other by looking through the timelines is an intriguing core concept, and their ability to sway others to their cause as they seek to turn time to their advantage is chillingly realized, especially as Jo herself is brought to Arianda’s side and the threats of time locks and complete erasure from time lurk in the background. In a short period of time, Smith is able to introduce and develop Arianda and her followers as an exceedingly credible threat that can challenge even the most seasoned of Time Lords, bringing humanity to the brink of self-induced destruction in the process. It’s hard to fault any story for this, but the only potential issue with ‘Storm of the Horofax’ is that it simply has too many ideas to fully explore in the allotted four episodes, a claim very few stories set in the classic era can make and a fact much preferable to the alternative. Just one more episode or even a few minutes here and there could have allowed the emotional and practical ramifications of the time disruptions to be fleshed out more thoroughly from the perspectives of all of those involved, especially Jo. Nothing happens without reason here, and the fallout of each action is dutifully discussed to make the story flow logically and seamlessly, but the fluctuating existence of Major Hardy in No Space as well as the rest of Adriana’s actions are so visual and visceral even in the audio medium that they could have easily anchored a longer running time while only amplifying their overall impact. As it is, however, ‘Time of the Horofax’ is still another fantastic entry in The Third Doctor Adventures range, one that again rightfully spotlights Tim Treloar’s uncanny ability to channel the quirks and moral fortitude of Jon Pertwee’s incarnation as well as the Third Doctor’s innate chemistry with the timeless Katy Manning as Jo Grant.